We’re just several days away from the beginning of Stade Bollaert-Delelis remodeling. Thanks to RC Lens and Lens Mayor’s Office we can now show you how the reconstruction went and will continue to do that until late December 2015. That’s when final delivery is planned, half a year before Euro 2016. 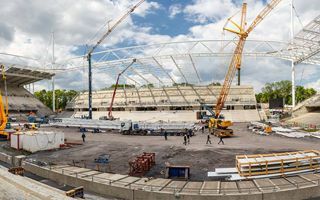 But, as the stadium is primarily being revamped for RC Lens, the club will play their first home game here as the new season commences. To make that possible works have to be in full swing until July as none of the key features is ready at the moment, two months before reopening. The old roof had to go, because it was too short and obstructed view of the field. New one will be supported externally, on four tall masts in each corner of the stadium. They’re already mounted into place and make the stadium visible from miles away. Rectangular truss is installed between the masts and is now being connected to the stands with secondary steel ribs. New outer cladding is also being installed as all access routes and concessions are being prepared for the partial reopening this summer. Recently issues with cables surfaced and prompted a re-evaluation, but it’s expected not to slow down the works. All of the project is expected to cost some € 70 million ($78m) and will see capacity fall from 41,000 to 38,000. However, should such need arise in the future and if RC Lens finds proper financial model, expansion to 45,000 is possible.